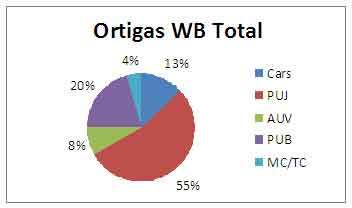 Fairly recent surveys (first quarter of 2011) along major corridors in Metro Manila have yielded the following data on transport modes shares in the National Capital Region. Such data, while quite specific for the corridors surveyed, strongly indicate that most people take public transport. As such, it is quite logical that public transport be prioritized and perhaps provided with the road space they require to be more efficient in conveying passengers to their destinations. There are mixed results in terms of which types of vehicles tend to dominate the road and these are noted below. Note that data for rail is not included but should favor public transport as well. Taxis, in this case, are classified among private vehicles. Trucks are not considered here as passenger vehicles though they do carry people. 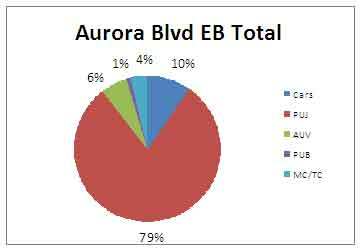 Person trip mode shares along Aurora Boulevard eastbound (to Rizal & Marikina) – jeepneys account for 79% of road-based transport while cars carry 10% of person trips. In terms of vehicle share of the road, cars account for about 25% of the road while jeepneys take up about 59% after converting jeepneys into passenger car units using the assumption of 1.7 pcu = 1 jeepney. Such assumption is also used in other estimates. 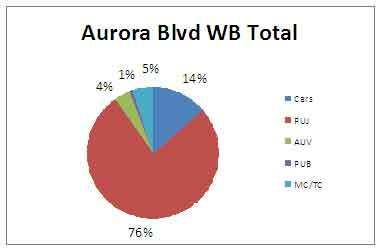 Person trip mode shares along Aurora Boulevard westbound (to Cubao/Quezon City) – jeepneys account for 76% of road-based transport while cars carry 14% of person trips. Meanwhile cars occupy 31% of the road while jeepneys use 57%. Interesting for the above statistics is the fact that these numbers do not reflect the actual share of public transport given that there is a rail transit service along this corridor. LRT Line 2, however, terminates before reaching the Province of Rizal, which necessitates the transfer of passengers from rail to mainly jeepneys towards their final destinations. 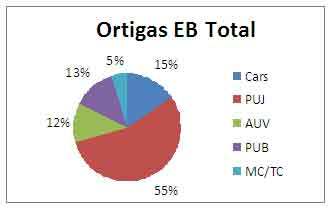 Person trip mode shares along Ortigas Avenue eastbound (to Rizal Province) – jeepneys account for 55% , buses 13% and AUVs 12% of road-based transport (total of 80% for PT) while cars carry only 15% of person trips. Cars occupy 37% of the road while jeepneys eat up almost the same at about 37%. AUVs are quite significant along this corridor taking up 12% of the road. Surprisingly, buses only occupy about 5% assuming 2.5 pcu = 1 bus. Perhaps Ortigas can be decongested if public transport services along the corridor are rationalized with many jeepneys retired in favor of the higher capacity buses. Person trip mode shares along Ortigas Avenue westbound (to Mandaluyong/Manila) – jeepneys account for 55% , buses 20% and AUVs 8% of road-based transport (total of 83% for PT) while cars carry only 13% of person trips. 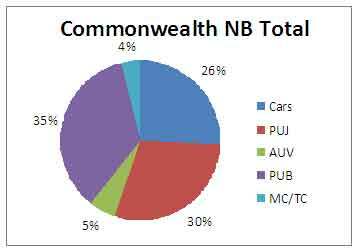 Cars take up 38% of the road, jeepneys also 38%, AUVs 9% and buses only 4.5%. Person trip mode shares along Commonwealth Avenue northbound (to Novaliches) – jeepneys account for 30% , buses 35% and AUVs 5% of road-based transport (total of 70% for PT) while cars carry 26% of person trips. Cars take up 57% of the road, jeepneys 17%, AUVs 6% and buses about 12%. Meanwhile, motorcycle account for about 8% of road space along Commonwealth NB. 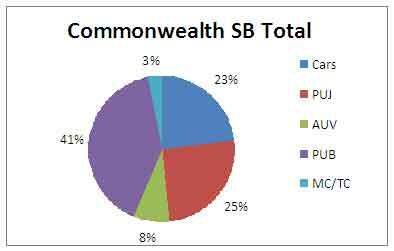 Note that Commonwealth is the widest road in the country with sections having up to 10 lanes per direction. The two outermost lanes are typically designated for PUVs while the 4th lane from the roadside is designated as a motorcycle lane. Note that there is a proposed MRT 7 to be constructed along Commonwealth and that system will also favor public transport users. Such a system should be more efficient in carrying passengers along the corridor and should provide an opportunity to rationalize PUJ and PUB numbers along Commonwealth. And such an opportunity should be taken and not passed up if government is really serious in improving transport in Metro Manila. Person trip mode shares throughout the country will surely have similar numbers if not higher shares for public transport compared to Metro Manila. This more than underlines the impetus for providing safe, efficient public transport services for Filipinos – a commitment that should not only be stated or printed but actively pursued with government in the forefront rather than on the sidelines. Graphs and other stats mentioned derived from data from surveys for the Mega Manila Public Transport Planning Support System (MMPTPSS), 2011. By d0ctrine in Mode Share, Public Transport, Transport Planning on November 18, 2011 . Hi, I’m currently looking for recent studies with regards to mode share or person trips. Can you give me a copy of Mega Manila Public Transport Planning Support System? It’s for my undergrad thesis. You can inquire about the study with the DOTC Road Transport Planning Division or go to the library of the National Center for Transportation Studies in UP Diliman. They should be able to help you with your research.